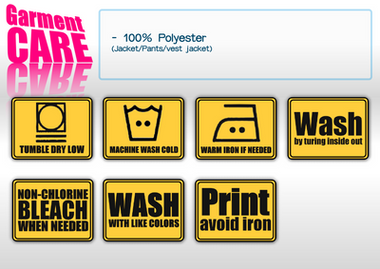 Clothes easily stained in different conditions everyday, here provides some guidelines for removing the stain on apparel. 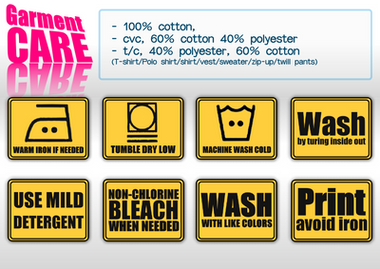 As garment is composed of different materials, guideline below is for reference only. 1. Solvent-soluble Stain (stain cannot be penetrated by water), pinch with dry tissue or cloth, avoid rubbing, stain will be more difficult to remove if it is penetrating into the fibre by rubbing. 2. Water-soluble Stain (stain can be penetrated by water), e.g. sauce, juice. Rub the stained area with wet tissue or cloth, stain will be soaked out easily. Permanent stain will form if stain is not treated as soon as possible. Rub the apparel using wet tissue or cloth, stain will be soaked out easily. 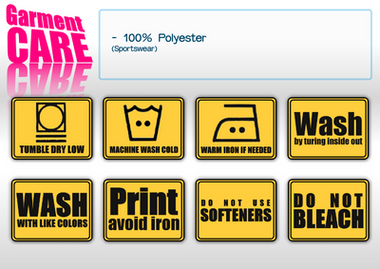 To remove stain thoroughly, follow by washing with detergent. Never remove the gum on apparel piece by piece until the gum is solidified by ice. Rub stained apparel with tissue or cloth soaked with warm water. To remove stain thoroughly, follow by washing with detergent, or even petrol. Rub stained apparel with petrol can remove egg yolk. Or Soak the stained clothes in warm water with detergent, brush with Ammonia. Blood stain can be washed by running water, avoid hot water. Rub with petrol, follow by diluted neutral detergent. Use bleaching agents if stain persists. Pen stain can be removed by ribbing with alcohol, followed by diluted neutral detergent. Dry under sunlight, brush the mold and germs with toothbrush. Soak the clothes in diluted detergent for half day, and rinse. Remarks: Removal methods vary with both the nature of stain and materials of garments. Appropriate methods should be used upon different cases.